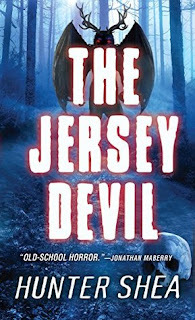 The Willet family have carried the mark of the jersey devil for generations ever since grandfather Boompa Willet and wife Lauren encountered the beast during their early years. Thereafter, children born to Boompa and Lauren and their children's children have carried the mark of the devil. What is its significance and why have sightings of the devil increased in the Pine Barrens region of New Jersey? Why has it become intent on murder in the most repugnant fashion? Boompa and his family, together with cryptozoologist friend Norm, decide it's time to find out and finally rid the family of the devil forever. The Jersey Devil by Hunter Shea is a corker of a tale. The characters are well-rounded and believable and the pace kicks off nicely from page one. It reminds me of the horror books I read in the 80s. The story isn't padded-out with unnecessary dialogue and it hits the mark on thrills and spills. I highly recommend to all horror aficionados.